If you ever find yourself saying or thinking, "Arrgggh, I'm so sick of having to constantly adjust my shades!" then we have some good news for you. There's a solution! No longer will you have to manually draw open or close your window coverings to match the time of day or the amount of outdoor sunlight. Oh no. You can now complete this action with the push of a button, or even have it done automatically without you even thinking about it. How? Why, with motorized shades, of course! A small motor connected to your shades – this little trick means that you won’t have to struggle with those frustrating strings any longer! When you want the shades open, closed, or somewhere in-between, all you need to do is use the remote. In fact, you don't even have to do that. Many motorized shade motor and controls brands such as Lutron and Somfy, offer smartphone connectivity too! It’s just another way to make things simpler for your busy lifestyle. And the good news doesn't stop here. Pretty much every type of window treatment, from roller shades to faux wood blinds, can be motorized. Whether you want your motorized shades to grant you complete blackout for your bedroom or to allow for some light filtering while also reducing glare, it’s all up to you. You won’t have to worry about oddly shaped windows either. Any blind or shade you get from us will be custom made to fit. Motorized shades can be the difference between lush colors and sun bleaching when it comes to your interior decor. Your furniture, books, paint, and various other parts of your home or office can suffer from UV damage. Prolonged and direct exposure to sunlight coming through an uncovered window can cause irreparable damage to these things. Sometimes it’s hard to do anything about it if the window is up and out of reach and you have to close it manually. Sure you can get a long cord to dangle down, but who wants that? Well, motorized shades can solve this problem. All you have to do is push a button, or even simply set a timer for when you know the sun will in position. Aside from protecting your belongings, motorized shades can also make your life a lot more convenient. You can integrate your automatic window treatments into your smart home system and have everything done without you. From watching TV in the living room without glare to being able to get a good night’s sleep without getting woken up by early morning sunrays. State of the art motorized shades will take care of everything. 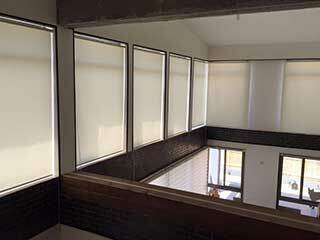 Want to get new motorized shades for your home or office windows? 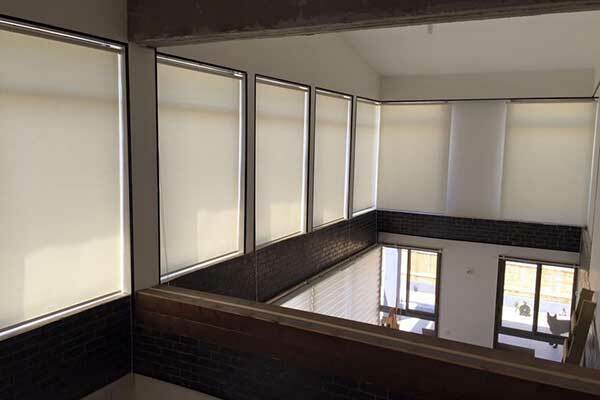 Irvine Blinds & Shades uses high-quality tools and meticulous attention to detail to assure each custom made shade is properly installed and able to work for years to come. Let us help you decide on which type of motorized shade option is right for you by contacting us today (using our service hotline or our online scheduling system) and booking a free consultation with one of our nearby experts.